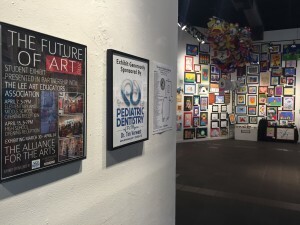 For the second consecutive year Pediatric Dentistry of Ft. Myers, Dr. Tim Verwest, DMD will be the exhibit sponsor for Future of Art at the Alliance for the Arts. Works of art created by elementary and middle school students across Lee County will be on display beginning April 6 with an opening reception on Wednesday, April 6 from 5-7PM. Work created by high school students will then be exhibited with a second opening reception on Wednesday, April 20 from 5-7PM and will remain on display until April 30. “The Alliance for the Arts really has done a wonderful job over the last 24 years with this project, we’re lucky to be involved with the last two,” said Dr. Verwest. This is the 24th year the Alliance has partnered with the Lee Arts Educators Association (LAEA) to provide students with an opportunity to display their artwork in a formal exhibit. This annual show features more than forty schools and hundreds of pieces of art in a wide variety of mediums. Judges will select winners in several categories and award a Best in Show.